We have partnered with the Rough Guides team to offer one lucky reader the opportunity to win a Via Francigena Walking in Tuscany trip for two. 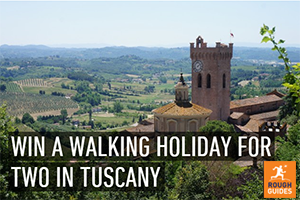 The prize is a week for two lucky Rough Guides readers walking the Via Francigena in Tuscany. The lucky winners will be walking from the pretty hilltop town of San Miniato, across picturesque countryside and quaint medieval towns, to spectacular Siena. Along the way, they will also get the chance to admire the quaint little fort village of Monteriggioni and the impressive medieval towers of San Gimignano, the inspiration behind Shakespeare’s Romeo and Juliet family rivalry. The prize also includes luggage transfers so winners can just enjoy the trail. And after a day walking, treat yourself to the finest local cuisine: San Minato’s famous white truffles, exquisite cured meats, a glass of red wine… make sure you enter this fantastic competition at: Rough Guides Walking in Tuscany Competition. The competition is open to readers in the UK, Ireland, United States and Canada until the end of September 2015. See Rough Guides for all terms and conditions.